Unique and stunning! This describes the Hinged Lid Top Gravity Fed Dispenser perfectly. Your customers won't have to look far to find your items with this snack container. Filled with brightly colored candies, snacks, and other items, this bin will be a favorite spot in your store. From candy stores to ice cream shops. Simplify and organize your counters and small spaces with the four divided spaces bins in one location. 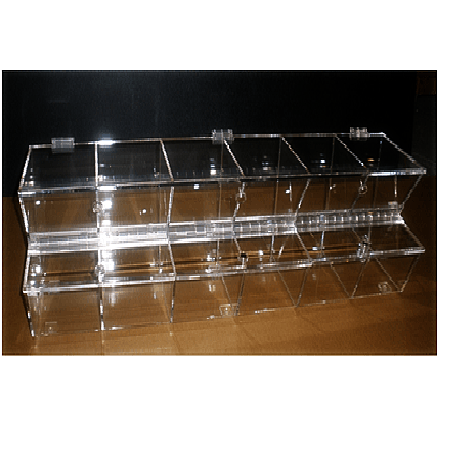 The easy visibility of the acrylic bin will increase sales and profits for your business. 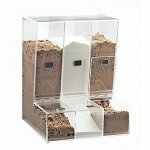 Order your display case today at All Candy Containers.